So I’ve been doing more work on RedPower 2. Today I mostly drew things, but I also got them working in world. Left to right, we have ruby, emerald, sapphire, silver, tin, copper, tungsten, and nikolite. Nikolite is the strange one on that list, of course. It’s minable into a powder that has the unique ability to store energy, which makes it important in the creation of Blue Alloy. I’m not entirely happy with the tungsten ore. It looks a little too much like coal. It’s tricky to manage a decent metal ore without environment map textures, though, since all the mid-grey colors blend into the stone. 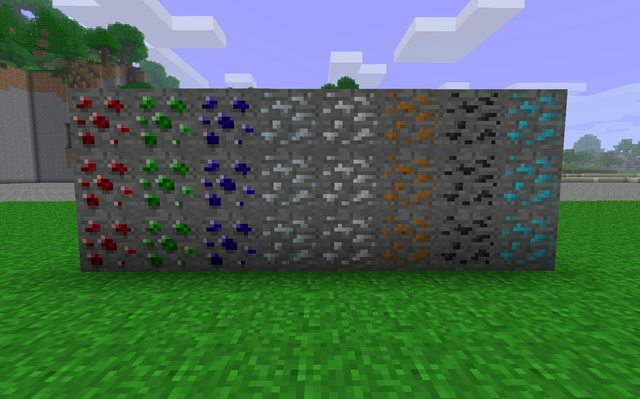 And of course, the ore overlays are entirely original, although they are applied to the Minecraft stone texture in the RedPower versions. 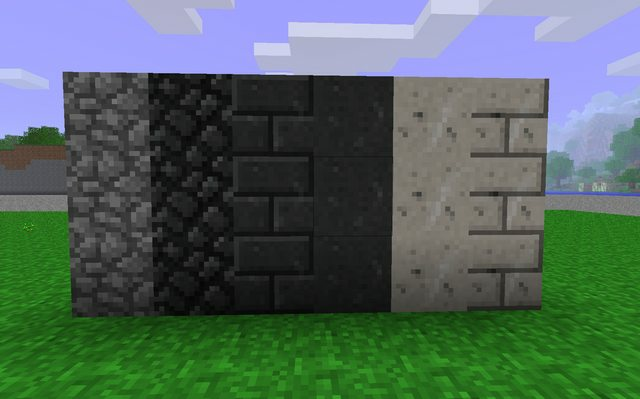 From left to right, default cobblestone for comparison, basalt cobblestone, basalt bricks, basalt, marble, and marble bricks. If you look closely, you will notice that the two cobblestone patterns don’t match. That’s right, I drew the basalt cobblestone texture from scratch. Just another art asset for Minia in the process of writing RedPower. Two, even, because the same layers apply cleanly to Minia’s granite texture, giving me an original cobblestone texture.